Eyemouth Harbour – The Harbour from Eyemouth Harbour Trust on Vimeo. A more in depth look into what makes this “Scotland’s First Port of Call. 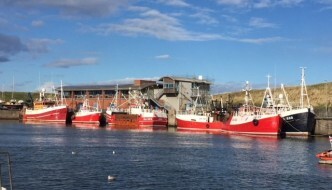 Eyemouth Harbour – Fishing & Sailing from Eyemouth Harbour Trust on Vimeo. An insight into the many facilities available at Eyemouth Harbour. Eyemouth Harbour – Offshore Wind Focus from Eyemouth Harbour Trust on Vimeo. A short video detailing Eyemouth’s fantastic links to its neighbouring offshore windfarms. Eyemouth Harbour – Short Introduction from Eyemouth Harbour Trust on Vimeo. A short general introduction to Eyemouth Harbour.